Siobhan spent the Easter weekend performing at the National Folk Festival in Canberra. After being invited to perform at the festival launch a couple of months previously, she was delighted to be asked to perfom in the Opening Concert in the Budawang (biggest venue of the festival). She also performed solo concerts at the Budawang, Trocadero and The Lyric – all really good venues. 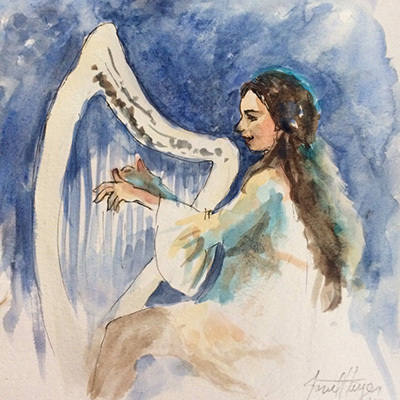 Here is a sketch of Siobhan performing at the festival by talented artist Janet Hayes. The festival was very successful for Siobhan. She had almost full houses, standing ovations and fantastic CD sales. She was also mentioned in a poem written by Rowan McKeon. Leave? The only clue’s the whoosh! In the safety of the harmony vibrating here. The ties that hold me down. White male poets reciting dead men’s words, again. Strummed guitars, and those white males, again. Jane lays waste to all my expectations. David rocks me off my seat with words. It’s Sandy, and she’s knocked my socks right off.